I'm back from rainy Scotland refreshed and rearing to go (ish). Hopefully everything ran smoothly in my absence and I see that Gary gave some winners and made a good profit for those that got the prices. I'm not fully up to speed with everything yet having only just got back into the office a couple of hours ago, so was struggling a bit for what to write. So I started reading and found an excellent article in the Betting School Insiders Report about how bookmakers methods have changed over the years and how they currently create their early prices. And more importantly how to exploit this. In the old days they had in house expertise, sharp minds to create their odds lines and more importantly these sharp minds knew what to watch out for with regards to changes in conditions and shrewd money coming in. These odds compilers took on the big bettors in a battle of whits and guile. These days Mr Bookmaker is focusing on his easy money, from slots, virtual racing and games of chance. All activities with a guaranteed edge and guaranteed profit for Mr B. So he gets his early prices from an outside supplier! This is all well and good, but the tissue prices come in 24 hours ahead of racing. This means that any changes that occur in the 24 hours leading up to the race are not accounted for, and bookmakers are not smart at adjusting for changing factors accurately. Because? Because they didnt create the prices in the first place so they dont know how much emphasis has been placed on any given factor, or what importance any change may have. The article is written by the highly respected Rory Delargy of http://racingconsultants.co.uk and is a real eye opener. 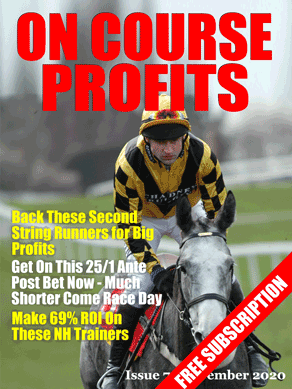 The people that took the £5 trial of the Racing Consultants service made over 60 points profit on Saturday. So even the modest £10 bettors came away with £600 profit. On the day they had winners at 7/2, 9/1 & 11/1. Along with an eachway Trixie with winners at 4/1 and 12/1 and a placed horse at 11/2. I've got a selection from the guys for you below. Another part of the service that I want to tell you about is the evening message. When Rory and David assess the racing in the evening, occasionally they will spot a fancy that has been way over priced by the bookies. When you get on at these prices you have locked in value and the option to trade out a bit of the bet for guaranteed profit. They found one such bet last night and I got the mail at about 8:00 pm and I got my bet on at 16/1. We hope to have more early messages now that the service is up and running, and those who've been trialling it for a while will be aware that we put Love Marmalade up as an overnight bet in May when he won at Musselburgh. On that occasion his SP was 3/1, but he was available to back the night before at 10/1 with a couple of firms. This time the horse in question is Concrete Mac in the 4.10 at Chepstow. The selection was a good fourth behind Fear Or Favour at Bath 2 starts back, and wasn't disgraced in mid-field last time. Both those runs came in higher grade, and when Hughie Morrison's charge was ridden by the inexperienced Charlie Bennett. Dropped into a 0-70 tomorrow, and with the underrated Pat Dobbs on board, he's capable of going well, and is completely the wrong price with those firms who have chalked the race up. He's far from a gimme (I was originally looking at Llyrical in the contest as he was a good second when advised at a Betfair price of 55 last time. ), but I would have him in at no bigger than 7/1, and he's been chalked up at 16/1 with both Paddy Power and Bet365. Paddy Power are also offering money back if your horse finishes second or third in this contest, which merely enhances his appeal. I'm happy enough to make him my Irish Field Nap, and will be stunned if he's not 10/1 or shorter by noon tomorrow. The £5 trial for one months access to this service is still available and I recommend you jump on board before the entry fee increases.